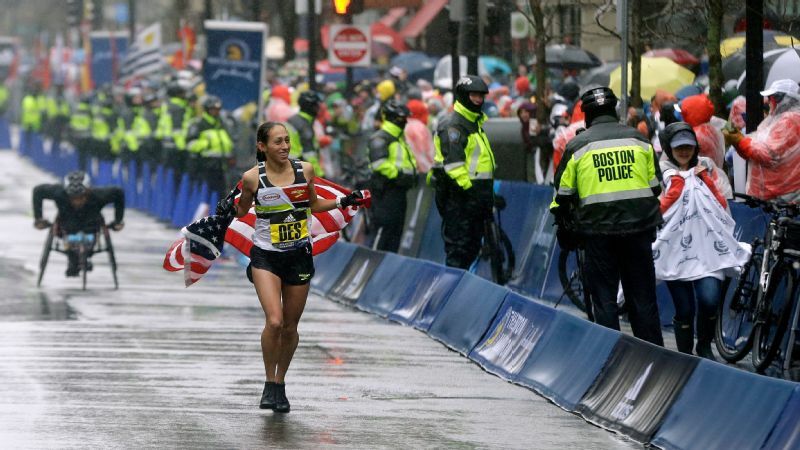 American Des Linden surprised a lot of people by winning the 2018 Boston Marathon. TEMPE, Ariz. -- Des Linden returns to her roots each winter, but those roots are hidden below ground as she wraps up a March morning workout at the Arizona State University track. Maroon and gold banners honoring NCAA achievements by other Sun Devil athletes ring the oval. The name of the defending Boston Marathon champion is not among them. When that absence is noted, Linden answers with her typical dry self-deprecation. Everything changed for Linden last April 16, when she slogged through frigid headwinds and sideways rain to win one of the world's most prestigious races -- a beautiful feat of perseverance in the most beastly conditions imaginable. It was also a singular rebuttal to her longtime label: always a factor, seldom a favorite. Linden was, in fact, an All-American in cross-country and track at ASU, but wasn't widely heralded when she turned pro. After a stirring second-place finish at Boston 2011, she logged a series of top-10 finishes at majors, earning respect as a consistent, gutsy runner, but often discounted as a threat to the chokehold East African runners held on the marathon. She chafed at being pigeonholed, and even in the rewarding year that has followed her 2018 triumph, the defiance at her core remains unaltered. Linden's identity is so intertwined with being underestimated that she keeps the notion in her tool box like a sharpening stone. "I think people will just put me exactly where I was before and chalk  up to the weather,'' she says over lunch at an outdoor patio near campus. "I think that would be short-sighted. If I were looking at a field or a race result, I'd say, 'Wow, she really knows Boston well; she's always been solid on this course.' But I still think people will just chalk it up to a fluke, which is fine. "The medal's real. It's in my house. The trophy's there. That's in the books. Moving forward, I think it's the thing that keeps me hungry. Once you've accomplished the thing you've been dreaming of your entire life, what's gonna get you out the door to try again? Yeah, I want to win Boston again, just to see if I can." This lead-up period to Linden's seventh appearance at Boston has been quiet and smooth. A big chunk of it was spent in Arizona sunshine, with periodic jaunts back to her home in northern Michigan and business trips to the East Coast. 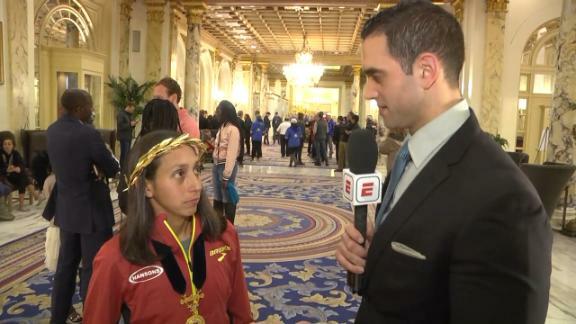 She pronounced herself happy with her fifth-place finish (1:11:22) in the New York City Half Marathon tuneup last month. It's a marked contrast from the turbulence a year ago at this time, when Linden, 35, was emerging from a prolonged malaise in form and attitude. 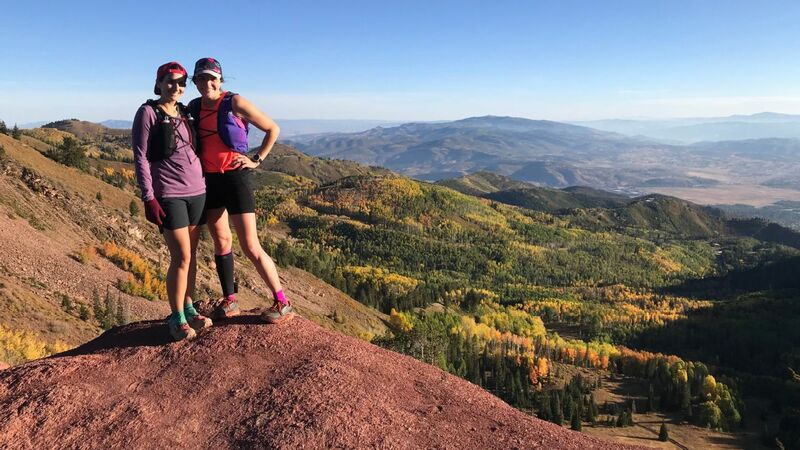 In late 2017, she was on the verge of "throwing my shoes away,'' or at the very least giving up on major marathons, and she skipped doing one that fall. After a long stretch of formative years with the Hansons-Brooks team, during which Linden bloomed from unknown into a perennial top-10 marathoner, tensions surfaced on the eve of Boston 2018, when, in response to a direct question, she matter-of-factly expressed discomfort with the group's recent addition of Dathan Ritzenhein from the controversial Nike Oregon Project. The backstory made for muted expectations and a giant question mark as Linden stood at the Boston start line. That punctuation morphed into an exclamation point as she found her legs while helping fellow American runners Shalane Flanagan and Molly Huddle, and kept churning through the miles even as other elite runners dropped out, some hypothermic, some mentally vanquished. The disbelief on Linden's face when she leaned into the tape and then fell into the arms of her husband, Ryan, and agent, Josh Cox, was real. 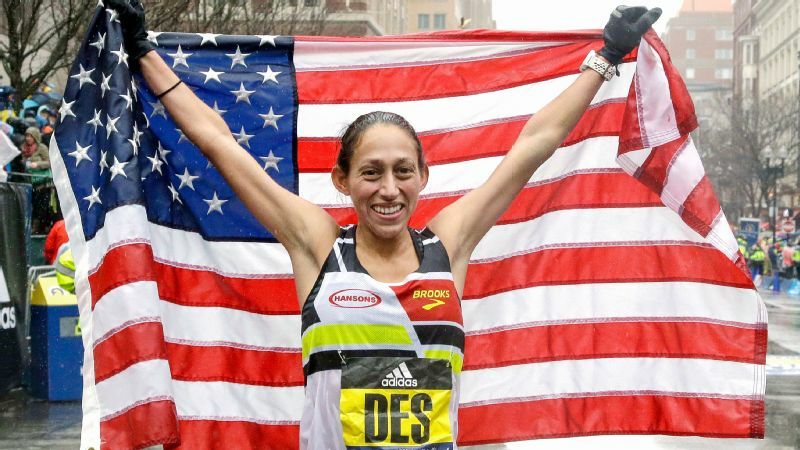 Winning the Boston Marathon showed Des Linden how tough she is during the most trying times. Tooling around Tempe the first week of March in a rented black Camaro, Linden is still close to the elation of that moment, yet never too distant from the frustrations that preceded it and the invisible asterisk attached to it: The first American woman to win Boston in 33 years did so with the slowest time in 40 years. Two months after the win, Linden made an official exit from the Hansons' suburban Detroit group (she retains Brooks as a shoe sponsor) and subsequently began working with her former ASU coach, Walt Drenth. It was an easy transition. Both have second homes in northern Michigan. She and Drenth, who left Tempe before Linden's senior year at ASU to take the job he still holds at Michigan State, never lost touch. When she was at her lowest, he encouraged her to break down the road ahead of her to its most basic parts. The past year has brought Linden a smorgasbord of commercial opportunities and other perks, from throwing out a ceremonial first pitch for her hometown San Diego Padres, to being a presenter at the Billboard Music Awards, to VIP access at a Formula One race in Austin, her biggest passion as a fan. But time has not resolved exactly what's next for her or whether she'll continue to compete and try to make the 2020 Olympic team, which would be her third. Her calendar, she says, is blank after next week. Monday's current forecast looks sketchy. Linden will run with ambition, but also with the luxury of knowing that the sky could fall in and she'd still be all right.